The Nivkhs are one of the minority indigenous peoples, who live in the region of the Amur river on the island of Sakhalin. Apart from the Nivkh people, other indigenous people who have long lived on the island are the Oroki (Uil’Ta) and Evenki people and until the mid 20th Century, the Ainu people. The Nivkh people have lived in the region for many centuries and indeed millennia. Their musical culture is rich and differs, in many respects, from contemporary European culture. Even at the beginning of the 20th Century they still followed an ancestral system, which ran through all facets of their lives, especially in their beliefs and their folklore. It is unique because it is so ancient and this determines many of its characteristics. The folklore of the Nivkh people can be divided into 2 groups, the first being distinctive by its ritualistic character and the second by its lack of ritual. Ritualistic folklore is the most ancient and distinctive folklore because it is closely interwoven with traditional beliefs. Many of its specifics can be appreciated through the prism of religion. Until the end of the second millennium, the Nivkh people’s complex beliefs were connected to shamanism and in particular with the particular worship of the bear, which even had its own festival and where music played a vital role. Nivkh music is chiefly vocal although it also uses musical instruments. In the most ancient forms the music is onomatopoeic and made up of signals. These are mainly imitations of animals, birds and the sounds of nature. Shaman rituals took on their own specific form of music and song. They were played during special gatherings for healing and augury when the Shaman came into contact with spirits. When a Shaman passes into a trance, his singing would move from exclamatory sounds, growls, wheezing, and different tonal modulations and rhythmic changes. 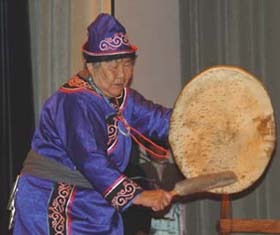 During the Shaman’s ritual, percussion instruments are often used, such as the Khas - a tambourine with rattles, as well as the Yampa - a girdle with metallic rattles. Apart from their musical role, these instruments have another function. The buben is a combination of a tambourine and a drum made either out of the skin of reindeer or seals. It is the main instrument of the Shaman and is believed to hold secret powers. Indeed it is believed that the power that calls up the spirits is contained within it. The girdle symbolizes the intermediary earthly life, as part of their trinomial view of the world, a characteristic of the ancient peoples of Sakhalin. One of the girdle's functions is to protect, as the Nivkhs believe that ringing sounds, noise and metallic bobs drive away the forces of evil. The bear ritual was a complex ritual, which lasted several days. This is the initiation of the main Nivkh totem, the bear, considered to be related to man. During the bear ritual the main instrument used was a percussive instrument, the Tyatya Chxach - Musical Log (a percussion instrument). It is played exclusively by women, who beat it with wooden poles. The pole symbolises the body of the bear. On one of its sides is carved the head of a bear. The instrument was considered sacred. The rhythm of the strokes depended on the rhythmical texts. The words were made up from ancient mythological texts, symbols, which are connected for the most part to the bear. The log dances were performed by the women dancing with fir twigs and wooden clacks – Korgosh - or with sacred bark from the Inau (a tree believed to have great healing powers). The dances of the women imitated the movements of the bear. These ritualistic dances were considered the climax of the Bear Ceremonies. The music of the Shaman Rites and the Bear Ceremonies belongs to the most ancient times and has its roots deep in the Neolithic period. The ethnographer E.A. Kreinovich, wrote: “During the days when I observed the Bear Ceremonies, I was overwhelmed by everything that I saw and heard. Indeed everything that the Nivkhs uphold to this day with their worship of the bear, comes down to us from the Stone Age, thousands of years ago, of which neither we, nor they (despite having preserved these traditions) have absolutely any comprehension. The epic genres of the Nivkhs are made up of myths and sung legends, both recited and in prose. In particular there are two specific genres; the Tilgush, which are heroic myths and the Nasmund, which are magic tales about wild animals and the need to co-exist with them. The songs reflect the everyday life of the Nivkhs. The majority of the songs are improvised, although there are some that have a fixed melody and text. Musical instruments are divided in to several different groups. The most ancient are the ritual instruments of the Bear Ceremony and Shaman Sacred Rites. Apart from these, the non-ritual instruments are very diverse. On Sakhalin one finds three types of Nivkh Jewish harps, the Zakanga, which is an arched form made of iron, the Kanga or Kongon, a brass and wooden laminar with an inner reed, and the more ancient Koka Chir which is a grass instrument. During the playing of the instrument the wavering of the reed amplifies with the help of the performers mouth, which is the main resonator. The melodies played by the mouth organ do not differ very much in difficulty, but the attraction is in the beauty of the flowing 'cosmic' sound, which is rich in deep overtones. Tynryn - a peculiar Nivkh viola with round bow - belongs to the string instruments. The playing technique is unique. The instrument has three soundboards: a pannier made of birch tree bark the fingerboard and the performers mouth. While playing the performer lightly touches the open string with the tongue causing a tremolo. In the result of that an extra overtone line in appearing. Therefore one can play even two or thee voiced melody. There are a great variety of woodwind instruments. 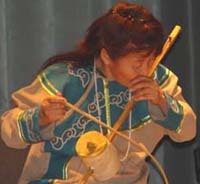 The simplest are the wooden buzzing instruments, which rotate on a long rope. Over the years they have served many functions from being used as ritualistic instruments, or imitating the sounds of the wind, or have even been used as children’s toys. There are many variations of the whistle, known as the Pevs, which is made from different kinds of cane – reed, bulrush, bamboo and others. Kalni is a peculiar musical pipe transforming the human voice. In to it melodies are sung with different colours caused by the vibration. Nivkh Folklore has always been carried from one generation to the next through an oral tradition. It has never been written down. This means that improvisation and variations of character make up the whole process of folklore creations. At first sight Nivkh melodies are not difficult in their formation. They are based on 3 to 4 musical degrees. At the same time if one listens carefully, one realises that they don't stay unchanged but vary all the time. Each sound should be thought of as a living organism. In most cases the melody represents improvisations on a theme. The same song sung by different performers or even the same performer will sound different every time and will never repeat itself. Variations will remain within traditional musical norms and will have been produced in that particular ethnic environment. All the songs are in one voice (without harmony) and without instrumental accompaniment. The instrumental music also has a solo character. There are two types of intonation – natural singing and singing with a throat trill. The second way is more ancient and traditional (with the throat trill) but only very few performers are able to master it. With this manner of performing the voice becomes richer, wider and creates different colours. I would like to draw attention to the perception of early folk music and its specific nature. Sometimes its sound goes fundamentally against the aesthetic norm of general European listening traditions. That is why its value must be measured against other aesthetic changes and criteria of beauty. In early folklore music, including Nivkh music, the beauty is not in a richness of harmony, nor in complete forms as is the case in European classical music, but in the finest nuances and micro movements within the improvisation and sometimes with completely unexpected developments. As a result, someone who has been brought up within other musical traditions needs to try to penetrate as deeply as possible the very roots of this culture and to comprehend the rich possibilities of expression (with the very minimum of recourses) in full appreciation of its humble beauty. In the twentieth century the traditional Nivkh way of life has chanced fundamentally. Due to this, the traditional lifestyle has also transformed gradually and with it the traditional beliefs and the rituals. This has fundamentally affected the culture. Some genres have begun to fade away and some have disappeared altogether. Nevertheless at the same time many musical genres have received a second life within the national folklore groups and we can only hope that this original and unique culture will not vanish and will continue to give us much joy for a very long time.